Hillslopes are an important part of the terrestrial landscape. The Earth's landscape can be thought of as being composed of a mosaic of slope types, ranging from steep mountains and cliffs to almost flat plains. On most hillslopes large quantities of soil and sediment are moved over time via the mediums of air, water, and ice often under the direct influence of gravity. The form a hillslope takes is dependent on the various geomorphic processes acting on it. Hillslopes are also the source of materials that are used to construct a number of depositional landforms. In practical terms, hillslopes have direct and indirect influence on a number of human activities. The steepness and structural stability of hillslopes determines their suitability for agriculture, forestry, and human settlement. 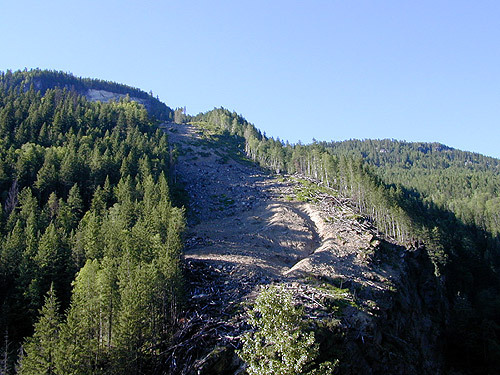 Hillslopes can also become a hazard to humans if their materials move rapidly through the process of mass wasting. We can begin our study of hillslopes by thinking of them as a process-response system. The hillslope system receives inputs of solar radiation, precipitation, solid and dissolved substances from the atmosphere, and unconsolidated sediment derived from the weathering of bedrock. The inputs of unconsolidated sediment are controlled by weathering rates. In general, the warmer the climate the higher the rates of bedrock weathering. Rates of weathering are also influenced by the presence of moisture. Outputs to hillslopes occur by evapotranspiration, by percolation of water and the movement of dissolved substances into the bedrock, and by removal of sediment by streams by glaciers or by ocean waves and currents. Outputs of debris or sediment from hillslope systems are controlled primarily by the availability of erosional mechanisms to transport material that accumulates at the slope's surface and base. For example, the presence of a stream at the base of a hillslope encourages removal of sediment that moves downslope. If the stream's discharge is too small to handle the debris input, sediment will accumulate at the base of the slope. The magnitude of hillslope inputs and outputs depends upon a number of factors, including bedrock geology, climate, and the nature of the slope to the broader landscape. The balance between inputs and outputs from the hillslope system exerts a major control over the form of the developing slope. In situations where inputs are the controlling factor, the slope is said to be weathering limited because outputs quickly remove any accumulating debris. Where the potential for weathering is high but outputs are restrained the hillslope system is classified as being transport limited. Landscapes that are transport limited are easily recognized by the presence of a deep soil profile. A variety of processes exist by which materials can be moved through the hillslope system. These processes are generically known as mass movement or mass wasting. The operation of mass movement processes relies upon the development of instability in the hillslope system. Under these conditions, failure of the slope material can occur on a range of time scales. Some types of mass movement involve rather rapid, spontaneous events. Sudden failures tend to occur when the stresses exerted on the slope materials greatly exceed their strength for short periods of time. In many cases, type of mass movement is produced by the operation of short term trigger mechanisms. Mass movement can also be a less continuous process that occurs over long periods of time. Slow failures often occur when the applied stresses only just exceed the internal strength of the hillslope system. where F is gravitational force, W is the weight of the material occurring at some point on the slope, and Ø is the angle of the slope. The internal strength of the hillslope system varies according to the nature of the materials making up the slope. Hillslopes composed of loose materials, like sand and gravel, derived their internal from frictional resistance which depends on the size, shape, and arrangement of the particles. Hillslopes consisting of silt and clay particles obtain their internal strength from particle cohesion which is controlled by the availability of moisture in the soil. Too much moisture breaks the cohesive bonds and can turn a solid hillslope into a river of mud. Rock slopes generally have the greatest internal strength. Internal strength in these systems is derived from the effects of the solidification and crystallization of magma or the lithification of once loose particles. The stability of a hillslope depends on the relationship between the stresses applied to the materials that make up the slope and their internal strength. Mass movement occurs when the stresses exceed the internal strength. This condition is not always caused by an increase in stress. In some cases, the internal strength of the materials can be reduced over relatively short periods of time resulting in mass movement. Many factors can act as triggers for hillslope failure. One of the most common is prolonged or heavy rainfall. Rainfall can lead to mass movement through three different mechanisms. Often these mechanisms do not act alone. The saturation of soil materials increases the weight of slope materials which then leads to greater gravitational force. Saturation of soil materials can reduce the cohesive bonds between individual soil particles resulting in the reduction of the internal strength of the hillslope. 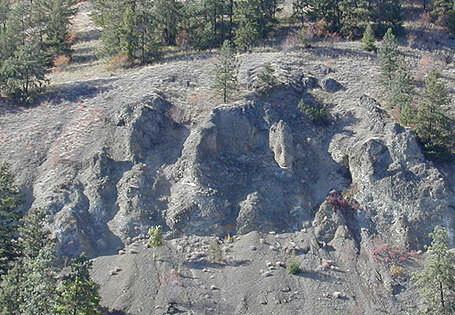 Lastly, the presence of bedding planes in the hillslope material can cause material above a particular plane below ground level to slide along a surface lubricated by percolating moisture. Earthquakes are another common mechanism that can trigger mass movement. The seismic waves produced by earthquakes vibrate slope materials. This vibration can lead to failure by increasing the downward stress or by decreasing the internal strength of the hillslope sediments through particle movement. Rainsplash is a microscale process that can be quite effective in moving material on slopes. The impact of rain droplets on the soil surface often detaches individual grains of soil moving them some distance from their source. On flat surfaces, the effect of rain drop impact is to redistribute the material without any net transport in a particular direction. However, on a slope the influence of gravity and slope encourage more material to be redistributed downslope rather than upslope. When slopes become 25 degrees or greater, almost all the redistribution occurs in a downslope direction. Considerable transport of surface sediments on slopes occurs by rainwash and surface runoff. On relatively flat surfaces, runoff occurs as a continuous layer of water commonly called sheetwash. The erosive potential of sheetwash is usually quite limited because this type of flow is shallow and non-turbulent and cannot readily entrain surface particles. However, topographic irregularities can quickly transform sheetwash into small channels called rills. Rills then coalesce into larger stream channels and so on. Rills and large stream channels concentrate the movement of water causing an increase in flow velocity and turbulence. Higher flow velocities and turbulence lead to a greater potential for entrainment and subsequent transport of hillslope materials. Many slopes are composed of non-cohesive, coarse-grained sediments. This type of slope is common to landform features like alluvial fans, screes, talus cones, sand dunes, and glacial outwash deposits. On slopes of this type, mass movement often occurs through the sliding or rolling of a small number of particles as localized instabilities develop (Figure 10x-1). In some cases, these movements can organize themselves into larger avalanches through a domino effect. Mass movement on non-cohesive materials can also occur by way of shallow sliding. Shallow sliding occurs when planes of weakness develop just beneath the surface of the slope. Planes of weakness develop where horizontal layering occurs in the sediment. This layering can be caused by the nature of sediment deposition, percolation of water, or by the presence of subsurface soil, sediment or rock layers. Figure 10x-1: Scree slope formed of non-cohesive sediments at the base of a steep hill. Mass movement on this type of hillslope occurs primarily by way of localized sliding or rolling of a relatively small number of particles. In many mountainous areas, shallow coarse soils develop over bedrock. Under the right consitions, large downslope movements of this material can occur. This type of mass movement is known as a debris flow. Slopes formed from clays and silts sediments display somewhat unique mass movement processes. Clay and silt particles have a degree of cohesion which gives them potentially more internal strength than non-cohesive sediments. This cohesion occurs because of electrochemical bonds which operate between particles and the surface tension effects of water films that forms around particles. Both of these sources of cohesion are dependent upon moisture content. Maximum cohesiveness takes place when mositure conditions are moderate. Too much or too little water reduces the strength of the cohesion. Two common types of mass movements in cohesive materials are rotational slips and mudflows. Both of these processes occur over very short time periods. Rotational slips or slumps occur along clearly defined planes of weakness which generally have a concave form beneath the Earth's surface (Figure 10x-2). Rotational slips can be caused by a variety of factors. The most common mechanism reason for them to occur is erosion at the base of the slope which reduces the support for overlying sediments. Erosion at the base of a slope can be caused by the presence of a stream channel or by wave action. Figure 10x-2: The head of a rotational slip in the Black Hills of North Dakota. (Source: Image provided by the National Geophysical Data Center, NOAA). Mudflows occur when slope materials become so saturated that the cohesive bonds between particles is lost. The saturated material then flows like a thick fluid downslope (Figure 10x-3). Flow stops when water loss through seepage causes the sediment to solidify. Mudflows can occur on very low slope angles because internal particle frictional resistance and cohesion is negligible. 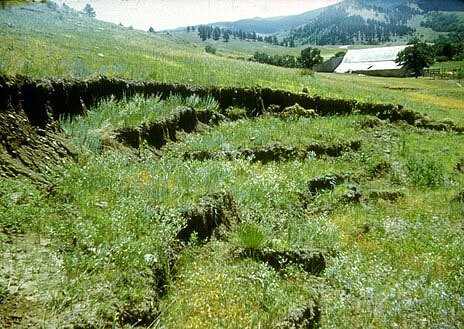 Figure 10x-3: The Slumgullian mudflow in the San Juan Mountains, Colorado. (Source: Image provided by the National Geophysical Data Center, NOAA). Some of the mass movement processes operating on cohesive materials occur over very long time spans. One of the most widespread of these processes is soil creep. Soil creep involves the movement of slope sediments in a series of numerous cyclical steps (Figure 10x-4). The cyclical effects of temperature fluctuations, variations in moisture, and gravity on inclined soil sediments often cause this process. Figure 10x-4: The following animation models the process of soil creep. Soil creep can only occur on a slope. It occurs when some mechanism causes the surface soil layer to expand and contract. Mechanisms that can cause this expansion and contraction include cyclical changes in soil temperature and mositure. Expansion moves soil particles upward and perpendicular to the angle of the slope. When contraction occurs the soil particles move downward under the influence of gravity. As depicted in the animation, the angle of this movement differs from the angle of the movement due to expansion. The net result is a slow downslope movement of the slope's materials. Solifluction is the slow movement of soil caused by freeze-thaw action. This process is a widespread in polar and sub-polar regions where permafrost exists. Solifluction occurs when seasonal or daily fluctuations of temperature are above freezing. At these temperatures, the upper portion of the soil surface and permafrost thaw creating waterlogged mass because subsurface ice prevents drainage. The waterlogged mass then flows downslope as lobes of sediment and surface vegetation. Mass movement on hard rock slopes is often dramatic and quick (Figure 10x-5). Hard rocks derive their internal strength mainly from the strong inter-granular bonds that form when magma cools and crystallizes or when lithification occurs in sedimentary rocks. Because of their strong internal strength hard rock slopes can have relatively steep angles. Nevertheless, weaknesses do occur along bedding planes and joints naturally found in these materials. Most mass movement on hard rock slopes involves the downward movement of small rock fragments pried loose by gravitational stress and/or freeze-thaw processes. We call these types of mass wasting rockfalls. 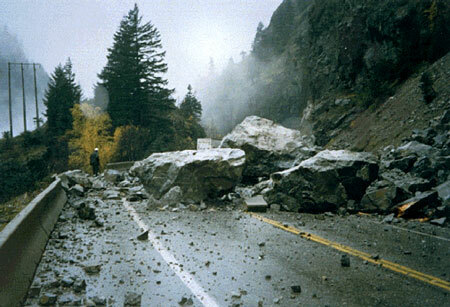 Figure 10x-5: Rockfalls from steep hillsides frequently disrupt road traffic in the mountainous regions of British Columbia, Canada. (Source: Image provided by Natural Resources Canada - Geoscape Vancouver). Larger scale downslope movement of rock can also occur along well defined joints or bedding planes. This type of movement is called a rock slide. Most rock slides occur because the hillslope and rock layers dip in the same direction (Figure 10x-6). In these cases, the rock slide occurs when a fracture plane develops causing overlying materials to slide downslope. 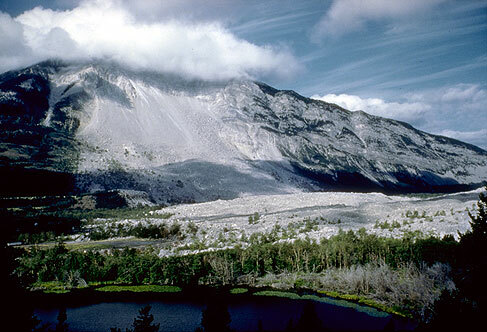 Figure 10x-6: Rock slide above Summit Lake, British Columbia, Canada. This rock slide occurred on April 2, 1999 at about 10:00 o'clock in the evening and involved the movement of about 200,000 cubic meters of material. Not all rock slides are the result of the process described above. The rock slide that covered the town of Frank, Alberta, Canada on April 29, 1903 was in part caused by human activities (Figure 10x-7). The sedimentary rock layers in Turtle Mountain dipped away from the valley containing the mining town of Frank. However, joints in the limestone layers did dip toward the town. The mountain was also composed of some structurally weak limestone, shale, siltstone, and coal layers that were deformed by the weight of more massive limestone located above. Finally, the mining of coal at the Turtle Mountain's base reduced the support to overlying materials. Together these factors lead to the sudden movement of 33 million cubic meters of rock in approximately two minutes. 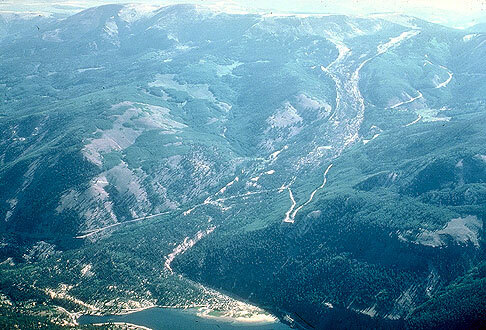 Figure 10x-7: The rock slide at Frank, Alberta, Canada (1903) moved 33 million cubic meters of rock from Turtle Mountain over the town of Frank in less than two minutes killing 70 people. (Source: Image provided by the National Geophysical Data Center, NOAA).